New for 2011, the Airstream. This baby is bright, and has great optics. The light is focused on the road, like an automotive low beam. So you have bright light on the road surface where you really need it, enough spill light above the road to see overhead street signs, and oncoming cars won't be flashing you to switch off your high beam. The "Supernova" text on each side of the light illuminates when the light is on, so you get some extra visibility for drivers to your sides at intersections. The battery is in the headlight itself. In the center you can see the heat sinks which keep the LED cool. A cool LED makes for a bright LED. 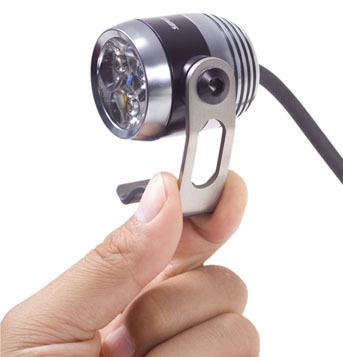 The light attaches to any diameter round handlebar using a heavy duty "O" ring. A spare "O" ring is included. The charger plugs in at the bottom, and the On/Off switch is on top. Four different light settings provide more light when you need it, or less light and longer battery run times when you can get away with less. The brightest setting is pretty intense, so you'll probably only need it on those rainy nights. Here's the original Airstream on my dreaded Rambouillet. Run time is between 2.5 hours to 24 hours, depending on the brightness settings used. Again, you will rarely need the brightest setting, so you'll probably never only get the 2.5 hour time. For all you gram counters out there, it weighs 165 big ones. The original Airstream is now out of production. We have the newer Airstream in stock now. It's brighter and has side illumination. See below. 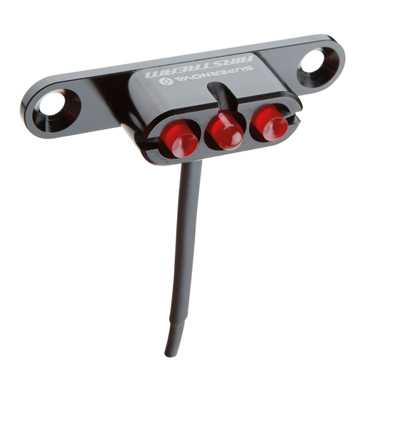 We now have the Supernova Airstream taillight that plugs into the Airstream headlight. 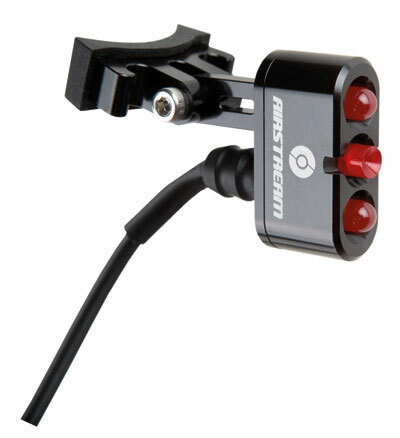 It connects to the charger input at the bottom of the headlight. The Airstream headlight senses that it isn't the charger and automatically powers the taillight when the Airstream headlight is switched on. 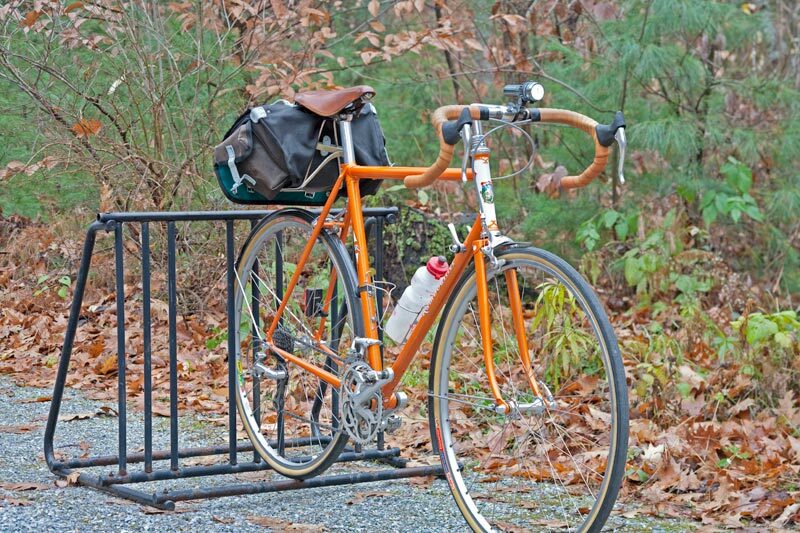 The Airstream Taillight mounts to the seat post, so it wouldn't work with the bike pictured above unless I removed the saddlebag. 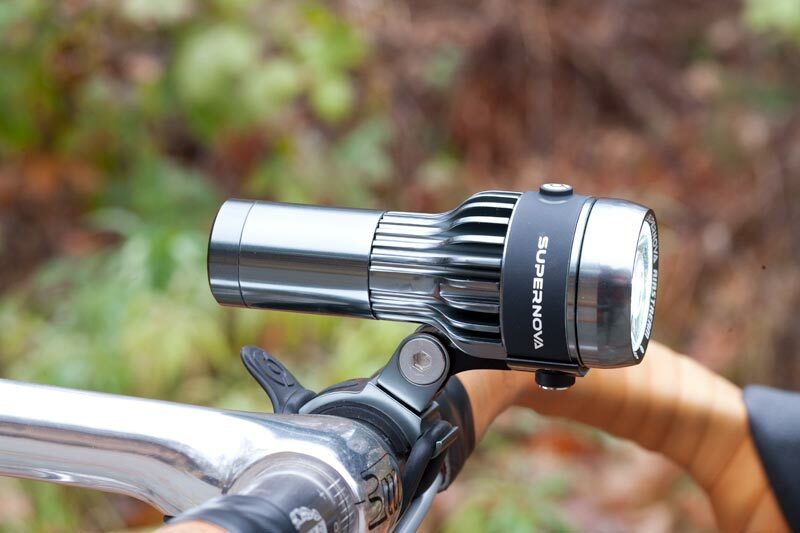 The Supernova M33 headlight has three extremely bright LEDs producing up to 800 lumens. There are five brightness settings giving a range of run times between 3.5 hours to 35 hours with the standard battery pack. 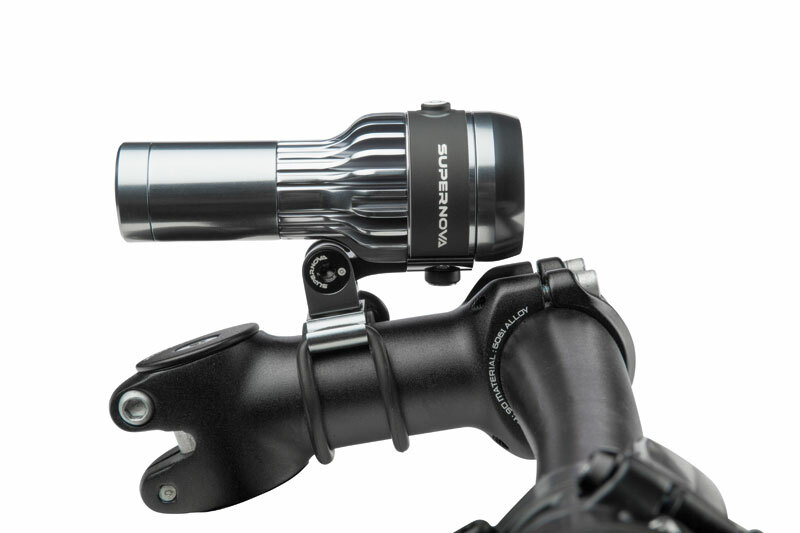 The light mounts easily to a handlebar or the top or even the underside of your stem, or on an optional helmet mount or head strap. The battery is held in a neoprene pouch and is strapped to the frame with velcro or kept inside a bag on the bike or a jersey pocket. For 2014, we now have the Airstream 2. While the photo above shows it in Grey, we also stock it in Black. It's a bit brighter than the original Airstream. Several brightness settings with run times from 2.5 to 7 hours. The base of the Airstream pivots. So it can be clamped to the stem, as shown, or, rotate the base and clamp it to the handlebar, as shown in the photo of my bike at the top of this page. Supernova makes versions of their taillights for use with the original Airstream and the new Airstream 2. These taillights plug into the charging port on the underside of the headlight. The battery in the headlight powers the taillight. For Supernova dynamo powered headlights and taillights, click here.